Wow! Izzy and I have been so busy that we didn’t realize a year has gone by since our last post. Well, time to catch you all up, I guess. We are still working on the relationship between Izzy and Louis (Izzy thinks it’s Louis; Louis swears it’s Izzy), but they really do love each other — even though Izzy lets Louis know he was here first and the bed is, after all, his. A couple of times this year, we left Izzy with our favorite dog sitter and were greeted enthusiastically when we returned. I often wonder what it would be like if we moved to another place, like Ecuador or Paris or someplace truly romantic, like Kenya! Would Izzy feel a bit out of place or would it be okay because we would still be together? I’ve been working nonstop on my writing since we last posted, and I’ve been fortunate to have some successes. In September, I spent some time at the Weymouth Center for the Humanities to write (and to heal after a horrible family tragedy). Throughout the year, there have been several essays published, I’ve republished my back list, and I have a new novel coming out next September entitled The Mourning Parade (about the plight of elephants in Thailand and the heartbroken women that dedicates herself to one of them). 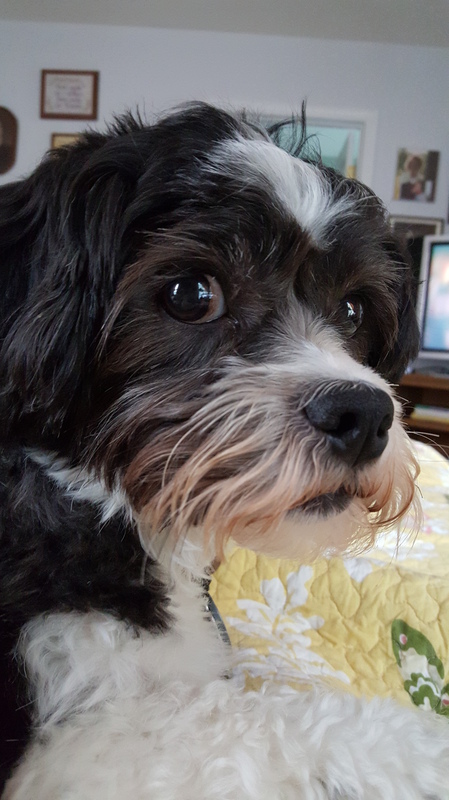 Take a look at what I’ve been doing, if you’d like: http://dawnrenolangley.com Throughout it all, Izzy sits and keeps me company, reminding me every couple of hours to take a walk! Right now, this little four-legged guy needs a haircut, but I hesitate to put him back with the same people who did him last time — because for almost three weeks, he walked with his tail held sideways. They’d clipped his skin in so many places, the poor guy still has scars. I’m seriously thinking of learning how to groom him myself. How about you folks? Do any of you do the grooming yourself? Hope you all are having a great holiday season. We promise to be better about keeping in touch. Lately, Izzy’s been confused about why the dogs across the street bark nonstop — and I’m getting irritated by it. I have to turn up my TV to the point where I feel like one of those senior citizens who refuses to get hearing aids even though s/he’s going deaf. But what we’re going through on our little street in North Carolina is really silly compared to what the dogs in Thailand experience regularly. In Southeast Asia, the dog trade is phenomenal. I’m not going to post photos here, but if you click here or Google “dog trade Thailand,” you’ll get your fill of some of the most disgusting photos you’ve ever seen. And they’ll break your heart. People shove dogs into tiny crates, so many dogs that their faces are smashed against the wires, and most of them never make it alive to their final destination. Let me say this: I respect other cultures and really don’t like listening to others who feel the need to diss others simply because their traditions aren’t the same. However, when it comes to saving animals, I’m not going to shut my mouth — especially when I look at the happy and loving dog who lives with me and think about the thousands of other dogs who never get a chance to live like Izzy does. 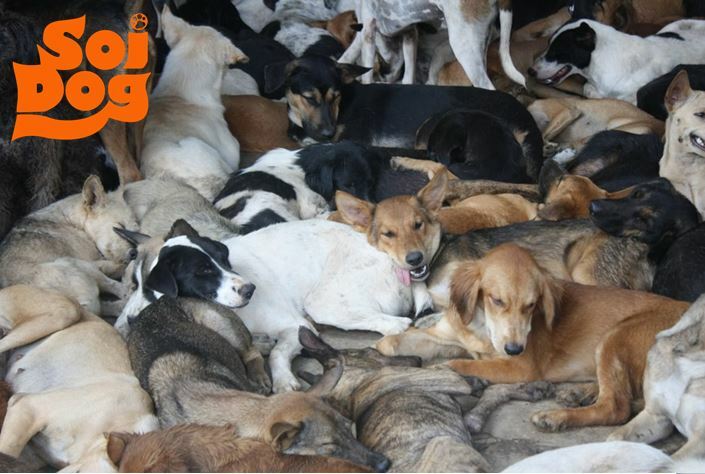 One of the clinics that works nonstop to save Thailand’s dogs is the Soi Dog Foundation. Their volunteers have worked tirelessly to bring the Thai dog trade to a screeching halt, but when you work to end a horrible business, you rarely realize what it’s going to cost to change that practice. The clinic’s volunteers have given of themselves — mentally, physically and economically, and I salute them as dog heroes. Hell, simply as heroes. If you have a dog that lives in a healthy and safe environment, like Izzy does, think about either giving your voice or your assistance to foundations like Soi Dog so that others will learn to respect the best friends humans have.